This article first appeared in The Edge Malaysia Weekly, on April 9, 2018 - April 15, 2018. WITH its debut last Monday, MBSB Bank Bhd — the result of a merger between non-bank lender Malaysia Building Society Bhd and foreign-owned Asian Finance Bank Bhd (AFB) — starts afresh as a full-fledged Islamic bank, one of 16 in the country. President and group CEO Datuk Seri Ahmad Zaini Othman, recognising that it is a highly competitive industry, particularly in the lending space, says the bank intends to differentiate itself in the area of transactional banking, as well as in digital capabilities. The former is something it can finally do now that it has a banking licence — recall that the main reason it acquired AFB was for its licence — and the latter is something that it is building up over the next 12 months. “What we intend to do is [ensure that] this bank must not be the same as any other Islamic bank. It has to be different from the point of view of customer service and product delivery. For a long time, banks focused purely on lending, but this bank should be more about transactional banking. We want to generate more fee-based income and deliver more trade finance facilities to existing and new customers. Managing customers’ liquidity and payment transactions are also something that will feature in our product planning in the future,” he tells The Edge in an interview. Transactional banking generally refers to services like cash management, payments, remittance, debit cards and interbank transfer. These are services that the bank plans to offer once its internet banking and payment systems are in place by the year-end. This is important as one of the key targets in MBSB Bank’s three-year business plan is to have fee-based income account for at least 25% of its total income by the end of 2020. The bank hopes that its approach towards customers will also set it apart from other lenders. It is pursuing proactive engagement, Ahmad Zaini says, in line with the group’s tagline “Part of Your Journey”. “We don’t offer customers a banking line, we offer services … the banking line comes second. If we see that you have a company, we’ll offer to manage your liquidity position, for example. Cross-selling is one of the main things we’re doing. We want to increase our customer-to-product ratio ... basically we think one customer should have at least three products with us,” he says. MBSB Bank, controlled by the Employees Provident Fund (EPF), is starting out with total assets of RM43.7 billion, making it the second largest standalone Islamic bank after Bank Islam Malaysia Bhd (RM57.7 billion). Retail financing makes up the bulk (78%) of its gross financing book of RM32.6 billion, with corporate financing making up the rest (22%). The bank intends for the retail-corporate ratio to be around 65:35 by the end of 2020 as it builds up its corporate business, particularly in the industrial hire purchase and property segments. In property, it will focus on providing end-to-end financing to property developers of affordable homes. Personal financing (PF), which constitutes the biggest portion (65%) of its gross financing and is extended mainly to civil servants, is something it does not plan to push hard. It will, however, continue to tap that customer base, enticing them instead to take up other products offered by the bank. “We have to continue our focus on civil servants by virtue of the fact that right now, a big chunk of the portfolio is still with PF. But our strategy will be different — the kind of things that we want to do for civil servants will be different from what we were doing. As I said, it’s not just offering outright financing but cross-selling to them our other products,” Ahmad Zaini says. As a bank, MBSB Bank will continue to enjoy the benefits of automatic salary deductions for civil servant customers, he says. This feature has helped keep defaults in its PF portfolio low, given that it runs into problems only if a customer loses his job or dies. While it reduces its focus on PF, it will make a stronger push in the industrial hire purchase segment, a business it started just two years ago. This basically involves financing SMEs that buy equipment for their own use or for rent/lease to other industries. “This is a great business, one I wish I had built up five years ago, as there’s hardly any NPFs (non-performing financing). It’s based on cash flows, there’s collateral, and the SME customers have been in the business for many years, so they are well-established. We think we’ve got a good grip on them, so we can offer a lot more products and services, especially in the area of current accounts and so on,” Ahmad Zaini remarks. Currently, industrial hire purchase accounts for just 2% of its total financing, while property financing accounts for 12%. “In property, we’re very cautious …we avoid mall- and high-end property financing. What we are concentrating more on is actually affordable homes, so, we finance things like PPA1M (1Malaysia Civil Servants Housing Programme) projects,” he says. “But, even then, we’re selective. Even if you say it’s affordable housing, we’ll assess it in terms of the location, size and things like that. The good thing about us is, we are able to assess the marketability of PPA1M projects based on the potential customers’ applications with the federal government,” he adds. MBSB Bank, which anticipates overall financing growth of 4% to 5% this year, has nine projects under PPA1M with a gross development value of RM2.2 billion, among other affordable housing projects. “The jury is still out on whether they can get strong financing growth going forward as it’s really competitive out there, so the focus on fee-based income is a good idea,” says a banking analyst who tracks the group. Meanwhile, on the liabilities side, Ahmad Zaini says that with a banking licence, it can now accept deposits from EPF. “We couldn’t take a single ringgit before. So now, that’s a big avenue for us,” he says. And now that it can attract current account deposits from customers, the bank should be able to lower its cost of funds, he adds. He says the group has no plan to get into stockbroking or investment banking at present. New ventures in the future may include microfinancing for SMEs. In line with its digital transformation journey, MBSB Bank is investing around RM250 million over the next 15 months to build up its capabilities. It plans to launch fintech capabilities in the third quarter in partnership with third parties, and internet banking by the year-end. The group embarked on data warehouse and big data projects in June last year, giving it better insight into its customers and their needs. 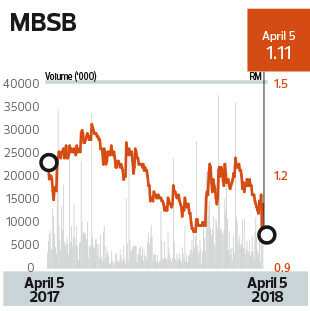 Public-listed Malaysia Building Society finalised its acquisition of AFB in February in a RM644.95 deal, with AFB — now rebranded MBSB Bank, which houses all the Islamic assets and liabilities — becoming a wholly-owned subsidiary. EPF now owns 63.2% of the holding company. Ahmad Zaini says the current financial holding company structure is needed as Malaysia Building Society still holds a small amount of conventional non-performing loans as well as certain properties that it intends to sell. Once this is done — it has a three-year deadline to do so — it is likely that MBSB Bank will take over the listed status. This is the second Islamic bank that Ahmad Zaini — a 35-year industry veteran who has been with the group since 2009 — will have helped establish, the first being AmIslamic Bank. He says it is important that MBSB Bank starts off right and as such, compliance is a top priority. “We’re pushing very hard to ensure we have a strong compliance culture. We’ll have a compliance officer in each branch to report to us on a daily basis of any infringement and the like. We want to start right. Yes, we’ll increase our costs by doing that … but to me, if you breach on compliance, it’s going to be an even costlier affair,” he remarks. The bank’s cost-to-income ratio of about 22% is the lowest in the industry and he does not see it breaching 30% this year. Its gross impaired financing ratio of 2.5% — compared with the industry’s 1.2% — is expected to improve further from aggressive collection efforts, he says. As for dividends, Ahmad Zaini says there is no change to the group’s policy of paying out a minimum of 30% of its net profits. Apart from EPF, the other shareholders are Tan Sri Chua Ma Yu (8.4%) and the former owners of AFB such as RUSD Investment Bank (1.8%), Tadhamon International Islamic Bank (1.1%) and Qatar Islamic Bank (0.7%). Bloomberg data shows that of the three analysts who track the stock, two have a “buy” call and the other, a “hold”, with their average 12-month target price at RM1.42. The stock, which has gained 3.8% so far this year, closed at RM1.08 last Friday.